← How Then Were Your Eyes Opened? Cynthia Long Westfall. 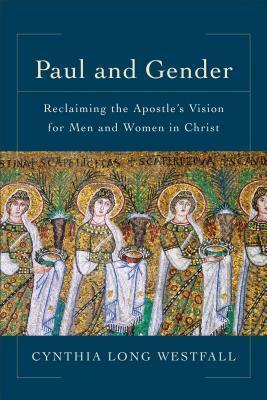 Paul and Gender: Reclaiming the Apostle’s Vision for Men and Women in Christ. Grand Rapids: Baker Academic, 2016. “Of making many books there is no end” (Eccl. 12:12). Sometimes this is how it feels with the debates surrounding gender and the Bible. The back and forth between complementarians and egalitarians goes on and on, with seemingly little or no new ground being broken, and the same basic arguments being reproduced. It gets a little wearisome at times. This was my fear when I got wind that my former professor at McMaster Divinity College, Dr. Cynthia Long Westfall was publishing a book on Paul and gender. Would this be a rehashing of the content of Keener and Payne’s work on the same topic? Could anything be added to those lengthy studies? However, I was also cautiously optimistic, since Dr. Westfall’s expertise in discourse analysis, Greco-Roman rhetoric and culture, and prowess with the subject matter, could bring some nuance and clarity. She exceeded any expectations I had. I knew it would probably be good, but this was outstanding (and, yes, I have a bias because she was my professor, and because we agree on this subject, but bias aside, this is still objectively a great book). The Bible in general, and Paul more specifically, is often a source of tension with regards to gender. Paul has been accused of being sexist, or at the very least, that he put significant limitations on women’s roles within the home and the Church with strict prohibitions against their participation in leading, teaching, or having authority (cf. 1 Cor. 14:34-35, 1 Tim. 2:11-15). But, as studies have continued to show, things are not as simple as they may seem. Dr. Westfall reads the Pauline letters as complete wholes (rather than in snippets used as proof-texts) and does so within the context of Greco-Roman and Jewish culture, and social structures (with special attention given to patron-client relationships). By doing so, she reads the “clobber passages” within the complete discussion of gender, and places that discussion within Paul’s discussions of authority more generally (the vocabulary and imagery used in depicting leadership and authority), the body, creation, eschatology, etc. and demonstrates that much of the imagery and language runs counter the common understanding of male leadership and female submission. A good example of how Westfall brings a fresh reading comes as she interprets Paul’s images of leadership, which often invoke imagery which in the first century would be understood to be feminine, and how that applies to relations between men and women. One the key examples is one of complementarianism’s key passages; Ephesians 5:22ff. There, Christ’s “headship” (and Westfall does do an awful lot of fleshing out of the meaning of the Greek word kephale, showing it rarely means authority over, and carries a sense of origin or source or preceeding) which is mirrored in the husband’s headship in relation to his wife, is couched in images of washing and stain removal. The man’s “headship” looks like doing laundry. Given the call of all Christians to submit to each other (Eph. 5:21) and the discussion of husbands and wives flowing from that, which uses different terms than we see in parent-child and master-slave discussion, we see Paul shifting out of patriarchal understandings rather than upholding them. Thus, the husband’s call to love as Christ loved, is followed by an explanatory image of submission and service, not a typical image of authority. This opens up a whole new way of reading texts like Romans 16 in which Paul commends multiple females leaders, who he identifies as deacons, patrons, apostles, co-workers and people who “toil” with him. The Greek verbs “co-work” (synergeo) and “toil” (kopiao) are indicators of leadership, as Westfall indicates through Paul’s use of these terms in 1 Cor. 16:15-16, which instructs the Corinthians to submit (Greek hypotasso) to anyone who co-works or toils. Payne’s work on manuscript data, and grammatical study was solid, but what Westfall adds to the discussion through her discourse analysis and investigation into Greco-Roman rhetoric on gender, builds on the work which precedes, and cuts new ground. By reading not just the clobber-texts, and the counter-clobber-texts, but reading the whole sweep of Paul’s work, and examining how the piece of gender roles fit together with the other pieces of creation, fall, eschatology, authority and leadership, and cultural norms of the first century, we see a newer, more robust picture emerge. While many of the conclusions are the same as other egalitarians’ works, the arguments are strengthened considerably by this new, deeper, contextual, more sensitive reading. These new questions are vital. How does Paul’s hellenism and his Judaism inform his choices of imagery and rhetorical style, and where does he seem to deviate, and how would that be heard by his original audience? How does Paul’s understanding of creation, fall, and redemption relate to gender? How does Paul’s reading of the body and sexuality (e.g. 1 Cor. 6-7) inform relationships in the family and church? How do the household structures of the ancient world, and social relationships outside it, when employed to describe gender affect how we read Paul’s discussions of gender? What about eschatology and soteriology, especially in texts like Galatians 3:28? Does this not affect how we understand gender roles rather than just equal soteriological standing? (Hint: yes, it absolutely does) If the person and work of Christ and the ongoing presence of the Spirit form leadership and authority, and redeem humanity, male and female, slave and free, Jew and Gentile, from the effects of the fall, what does that look like, and what does Paul’s choice of the imagery of service and domestic roles mean? As a result of the tearing down of these destructive systems, many women in Paul’s circle come into key leadership positions, and the women in Corinth are encouraged to exercise freedom to prophecy and pray in the gatherings (1 Cor. 11), with heads covered, which was a cultural symbol not of subjugation of honourable status for women. This reinterpretation of the head-coverings is a remarkable distinction between the work of Westfall among other egalitarian scholars (e.g. Philip Payne). She argues that Paul is encouraging all women, not just those of married free-woman status to wear the symbol of honour. Young, unmarried women, and female slaves were typically not to wear head-coverings, and the wearing of head-coverings symbolized a woman coming under the cover of a man. Thus, Paul is arguing a woman has an honour of her own, not through marital or social status, but from her creation in the image of God as a woman, and that woman as “the glory of man” is not an indicator of subordination, but that she shares in the image of God and of man, and was created to complete man, and carries an additional glory. Thus women are neither ontologically lower than men, or restricted in role, with the provision that she cover her head to demonstrate her honour, rather than remain uncovered suggesting a lower position. Since 1 Cor. 11 states that women in Corinth were praying and prophesying, and 11:11-12 speak of the mutual dependence and origin (Eve came from Adam, and all subsequent men being from a woman), any assumptions of women prohibited from leadership in the gathering of the church or in the family doesn’t the overall picture Paul is creating from the home and the church. One final argument worth noting is the emphasis Westfall places on the location of the gathered church- in the home. In Greco-Roman thinking, a woman’s sphere was the home. Paul even calls young widows to remarry and to oikodespotein (“rule the house”; often softened to “manage their homes”, but this is misleading). The church gathering was not a public gathering, but a domestic one. In the domestic world, women were used to leading and managing. Thus, in the early church, women naturally stepped into leadership roles. Westfall’s conclusion is that Paul supports a movement away from patriarchy towards an egalitarian view of gender, in which men and women partner together and support each other in fully expressing their giftedness, and all leadership roles, whether in the home, church, or society, are open to both genders. This does not in any way remove the distinction between the genders, or reduce gender to anatomy. But it does allow for women to fully engage in leadership, and use their gifts from preaching, teaching, leading, or whatever, recognizing that these tasks may legitimately be done by people of either gender, even though the expression of those roles may look different coming from one gender than it does form the other. She does this not, as some suggest of egalitarians, by setting aside clear directives from the New Testament, but by showing how those passages read in light of a larger theology, and the flow of Paul’s argument, and through close examination of Paul’s overall argument and choice of vocabulary, do not support the complementarian reading. The proof-text approach does not hold up to the scrutiny Westfall brings. The picture which emerges from Westfall’s research is a coherent theological vision of power structures like patriarchy being counter to the vision of God at creation, and the vision which Christ’s work in the world is bringing into being as Paul taught. Westfall puts the most often cited complementarian arguments (Carson, Schreiner, Moo, Grudem, Piper, etc.) under close scrutiny and reveals their shortcomings. She has put together a masterpiece of a study, which should (and I think probably will) become standard reading for seminarians as we attempt to shape a theology of gender within a broader biblical (or more specifically Pauline) theology, as opposed to the cherry picking bible verses to define gender roles approach. What Wesfall has presented is thorough, compelling, honest, and overall a “game changer” of a book. I didn’t think there was new ground to break, but was happily proven wrong by this one. This brings fresh perspective, and sets a new course of investigation. She doesn’t just present a new piece, but broadens the possibilities for future discussion in her breaking of new ground. By taking a different road than egalitarian scholars, the same data (the letters of Paul) yields new and important conclusions and raises new challenges. This entry was posted in books, culture, egalitarianism, leadership, New Testament, Paul, practical theology, Stuff I Like, theology. Bookmark the permalink. Thank you, Laura. I am familiar with Marg, and we’ve had a few interactions via Twitter and Facebook. She’s doing excellent work making the scholarly work accessible and available.